Sloshing through the deep winter snow, crossing ankle-deep creeks, tracking that game, fishing by the ice hole all day long, working outside, or being on patrol, water and cold will do nothing but try and get at your feet. You know you need the best solution to get good care for your feet while on duty or in the field, and the answer comes from those who answered the same questions before you: the military. What better place to look for suitable protection from cold weather and moisture if not in the long-tried-and-tested army toolkit? So let’s see what are the time-tested boots worn in training and in combat by our servicemen and servicewomen, and that are also available for civilian purchasing, either from military surplus outlets, or direct from manufacturers working for the Army. Some of the military winter boots presented here have versions for women, so read on if that’s what you’re after. Get your hands on (and feet in) the original US Army-issued “Mickey Mouse” combat boots. These boots are not just Army-issued, but also made in the USA. They weigh 44 oz. (1.25 kg) apiece and are rated for temperatures down to ?20 °F (?28.9 °C). Says Wikipedia: “The linerless bulbous boots retain warmth by sandwiching up to one inch of wool and felt insulation between two layers of rubber and are typically worn with one heavy wool sock. These boots were originally developed at the Navy Clothing and Textile Research Center in Natick, Massachusetts, US, for use during the Korean War. 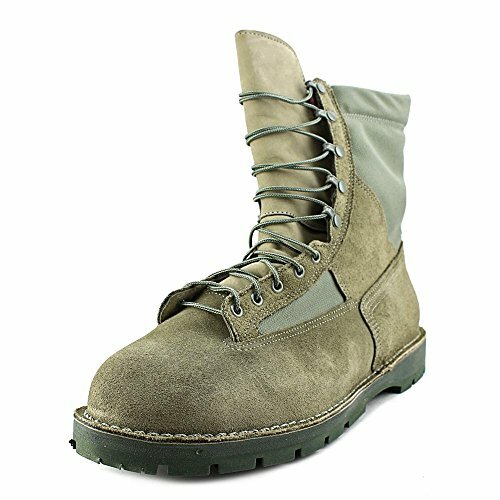 Originally designed for the military, such boots have become staple cold weather gear both in civilian work and recreational environments.” They are so well insulated that they will retain the temperature they had at the moment you put them on. If they’re warm, you’ll love them; if they’re cool, you’ll hate them. Toss them by the heater before going out, or leave them somewhere warm all night long, and in return they’ll keep your feet warm and comfy for a really long time. Being made of rubber, that means they’re waterproof. Ankle-deep water won’t be a problem for these boots. Even if you step in deep water and water gets in, it will get warm shortly and it will feel like walking in warm soup until you can go inside. Once drained, they dry out quickly and you’re good to go again with a new pair of socks. These boots are somewhat heavy but comfortable and offer great ankle support. They are a good fit for any extended activity in cold outdoors, from work to walking to fishing. They fare particularly well in static activities like fishing, where your toes go cold despite the price tag on the boots you wear. The “Mickey Mouse” boots, or the bunny boots (see below) are among the few you can rely on to not shorten your day because of freezing toes. The white military Bunny Boots are a newer addition to civilian-available stock and are the Type II after the Mickey Mouse ones which are the Type I. Their official name runs: Extreme Cold Weather Vapor Barrier Boots, and are rated for temperatures down to -65F. They’re called “bunny boots” for the Alaska rabbit that changes its fur from brown to white in winter, or because they make your feet bulky Bugs Bunny style. In Alaska, by-the-way, bunny boots are very popular, which says a lot about their performance in extremely cold weather. Actually, if it’s not freezing cold enough for these boots, you’ll get hot and steamy feet. Don’t spill diesel fuel on them. Their rubber is made from diesel oil and gets eaten away by diesel fuel. These boots are not a good fit for this type of work environment. These boots are not breathable, and if your feet get hot and sweaty, you may want to use some absorbent liner on the inside. Go down one size or half-size when purchasing them, since they are made larger than normal sizes. Read more on this here. They are thin enough to let you drive a car without catching pedals. The top part rubs against your calf so wear socks two or three inches taller than the boot. The boots have a valve that must be opened when airborne to ensure the inner pressure won’t puncture the rubber layers. All in all, these boots are what it takes to help you win the cold war :). This is another type of high-quality boots manufactured for the US Army. These boots offer superior protection from cold with their 600 grams of Thinsulate insulation (per boot). They also offer very good traction on the ice, due to the VIBRAM 360 FIRE & ICE outsole. The build is from great quality all full grain leather and nylon fabric. These boots will last long even under intensive work conditions. The construction is good with great ankle support, the toe is steel-covered meeting the ASTM Standards. On the inside, there’s a Goretex waterproof fabric bootie for sweat retention, and a polyurethane removable insole that will make you feel comfortable all-round and won’t get you blisters or sore feet. They are true to size. The boots will fit as advertised. The leather is petroleum, oil and lubricant (POL) resistant. The height is 8” (Standard military height). While on the pricy end, these combat boots made for the USAF by Danner in Portland, Oregon, come with hard-to-match craftsmanship. This is a boot entirely hand crafted, from upper to sole. The full-grain rough-out leather and 1000 Denier nylon upper is tough enough to last for years. The nylon portions are there to ensure improved breathability. The handmade sole delivers great traction on ice and rough terrains, allowing you to focus on the task at hand. The 600 gram in the name derives from the fact that each boot has 600 gram of Thinsulate, which is a redutable but lightweight barrier against cold. These boots also feature a USAF-standard Vibram 1331 outsole with a wider lug for a larger traction surface on slippery surfaces, including the Dri-Ice rubber compound to preserve elasticity and grip in cold environments. Both the leather and nylon used in the upper are waterproof, and in addition the whole interior is lined with waterproof and breathable Gore-tex material. The Gore-tex lining will prevent your feet from overheating, even in warmer weather. As a side note, Danner was the first manufacturer to use Gore-tex in their boots, starting back in 1979. Comfort: once broken in, which may take up to a month, they will become very comfortable. The lace to toe system gives better fit and support. The upper part of the boot has the lace loops that allow to tighten the lace fast and securely, thus forming what Danner calls the “speed lace” system. One important aspect to keep in mind is that these boots are stitched-down into the sole, which allows them to be recrafted by shipping back to Danner’s facilities in Portland. Recrafting means the outsole is replaced, leather is reworked, and the seams restitched. They cannot recraft torn or badly damaged leather, or boots without stitchdown construction. This boot is advertised to be Berry compliant, which, for those who don’t know, means they are produced 100% in the USA, and from USA-obtained materials. In conclusion, the USAF 600G is a truly great boot that will make you go a long way. And by recrafting it, you can go even farther. See more details and reviews here. The version for women is here. 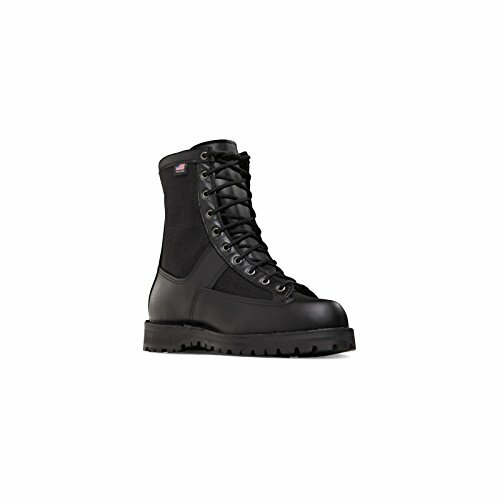 These are the insulated black polish Acadia boots from Danner. Not only do they look good, they are also heavy-duty performers. They are perfect if you work in EMS, fire rescue, law enforcement, security, or any other work place that requires long wear hours. Not last, they are perfect as uniform boots, like their name says, since they polish very well. The materials are prime grade leather and tough Cordura (1000 Denier) nylon, with Vibram soles. The outsole is made of Vibram kletterlift for superior shock absorption. They give great traction on wet and hard surfaces, as well as on snow. They are warm from the 400g of Thinsulate and keep feet dry with the Gore-tex lining. They also feature an ASTM-rated toe for safety. The stitchdown construction is a Danner hallmark for durability, and also ensures the boots can be recrafted. Every piece of leather used in Danner boots gets tested before use, and that’s why the leather frequently outlasts the soles (which is unusual in most boots), and with resoling and recrafting, your boots can last you upwards of ten years. The leather is high quality, just take care of it with Danner boot care products or other similar ones and it will last for a long time. One thing to keep in mind is that these boots may run a little narrow, so make sure to order the wider sizes if you’re wider in foot. Another pair of genuine G.I. military-issued boots that won’t break the bank. 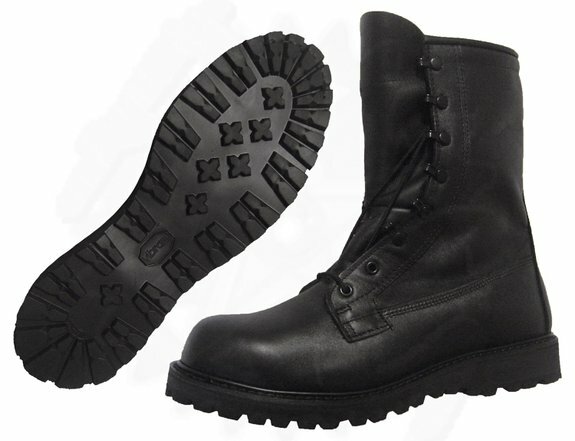 These are the typical-looking military boots and are rated for temperatures down to 10 degrees F. They’re made of waterproof and breathable leather with goretex stitches, with stitched-on vulcanized rubber sole with Energy-Return technology for increased energy conservation during walking. They are lighter than the two types of boots presented above, so are more fit for walking and hiking. If the temperature in your area rarely goes below 10F, chances are you’ll find these boots to be perfect. If you’re on the move, they will perform well even down to 5 degrees F. But these boots are okay to wear even in warmer weather, especially if you require the waterproof capabilities. For once, these will make perfect biker boots. The boots come with booties that absorb moisture. Some people sweat a lot even in the winter, and the sweat wicks right into the booties and away from the feet. Wear them with woolen socks, or with a pair of lining socks plus boot socks. They can take standing in water 5-6 inches high for several minutes without any leaking, so crossing creeks on the way will not be a problem. Another great feature is the ankle support delivered by these boots, which is well appreciated on rough terrain. These boots are rugged, will last a long time, and give your feet a great deal of comfort. Owners vouch the Defenders look and feel like the Acadia Danners for a fraction of the price, and reportedly can take 4 years of abuse with ease. The leather is stitched to the Dura-Shock and Vibram sole, which adds significantly to their life. The soles are super tough and the boots are comfortable out of the box. They have a short break-in time, and are very comfortable during long standing times. The leather at the top is soft enough so there’s no chafing under the calf. While these boots aren’t waterproof, they are water-resistant. They feature breathable Dri-Lex lining to keep moisture away from the feet. The Defenders feature a lace to toe system for a snug fit, and side zippers for short pull-on and out time. The zippers feel sturdy and tough, not the cheap kind. These boots are an extremely good value for the price. 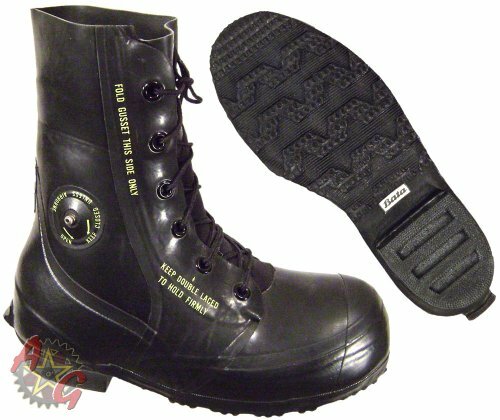 If you work in the police, security, EMS, or fire department, these will make great and reliable duty boots. Arguably these are the best boots for cold weather or the best boots for winter that are out there. Not just the best military winter boots, but some of the best winter boots, period. Read the reviews from owners in the links above, and you’ll be convinced. They’re all good work boots, but it really depends on your working conditions. If you live and work in Alaska or other freezing areas, then the Bunny boots are very popular in those climates. 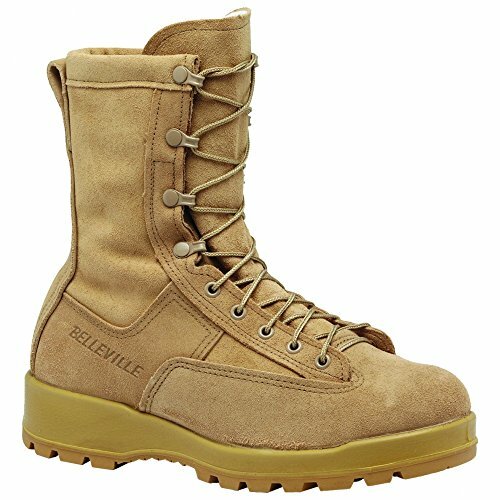 If you have milder weather, you could go with the Belleville or the Danner USAF. The Belleville has a steel toe which makes it suitable for construction work. These boots will last for 2-3 years or more under really heavy work conditions. They are not just durable, they’re also comfortable, and that’s a thing people who work hard appreciate greatly. Truly waterproof are the all-rubber Mickey mouse and Bunny boots, with a second best being the Combat Gore-tex boots which can take several minutes of standing in water without leaking. The other boot models could take a fast crossing of a large puddle or shallow stream of water, but they would be best described as water-resistant. They all behave well when walking in snow, but keeping compact water out for longer than a minute is a different story. 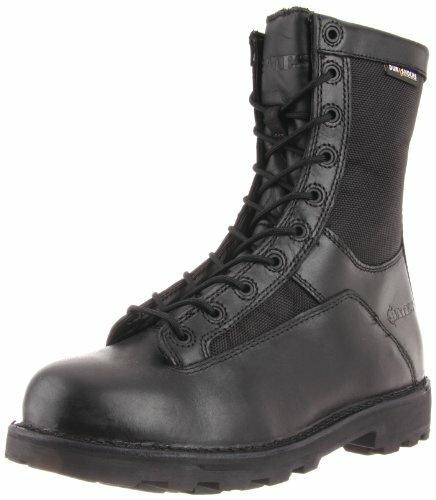 People working in the army, law-enforcement, security, and EMS tend to prefer black polished boots. Any of the three models we presented are suitable. Those who don’t want to pay the higher price tag for the Danner Acadia boots, will find the Bates or the Goretex ones well satisfying. They are army-grade, long-lasting and comfortable. Again, these are arguably the best boots for snow sloshing that are out there, and we’ll review other kinds and brands in an upcoming article. Are these the best boots for ice as well? The Vibram soles used on most all of these boots gives them great traction on ice, much better than any regular boot you may have used so far. Since these are snow and winter boots, one main purpose is for them to keep feet warm. However, it all depends on how harsh the weather is, that you’re using them in. For Alaska-style frosts, you’ll only be warm in Bunny boots, especially if you want to be warm for a longer period of time. Again, if you do ice hole fishing, you will need boots that keep you warm the whole day, which is a hard thing to find – again, the Bunny boots will do the job. The Belleville and Danner USAF boots will keep warm in really cold weather but for shorter periods of time. The models labeled for moderate cold weather will do a good job at keeping warm in city conditions or situations where you don’t stay out a whole lot. Three highly-rated models of black winter boots are available. Wear a shiny polish at all times and take my advice to not cut corners and buy the cheapest polishing stuffs if you want to get a long life out of your boots.